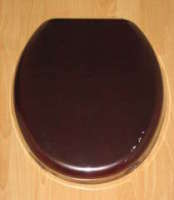 Attractive tecnoplast toilet seat finished in Black. This seat is fitted with a chrome plated hinges for greater strength. Would suit most standard UK oval toilet pans. Not suitable bottom fix seat.